The hitherto unseen British material contained in Volume I includes: a series of letters written by senior officers on Wellingtons Staff to Sir Thomas Graham immediately following the battle: The letters of a member of the Wedgewood family in the Guards at Waterloo; The journal of Sergeant Johnston of the Scots Greys, detailing all his experiences, including a very rare transcript of his own court martial! ; and the journal of an artillery officer supporting the sieges of the French fortresses by the Prussians after Waterloo; also letters from eminent surgeons including those of Hume, Davy and Haddy James, who served at Waterloo with their harrowing tales of the wounds suffered. Also the diary of Creevey’s daughter in law, giving many more particulars than his own famous account. In addition to these letters and journals, Vol I will include 21 original line drawings produced by Cavalie Mercer to accompany his famous book on his experiences at Waterloo but never previously published. A germ of an idea sown by Michael Leventhal of Frontline Books, to follow up the critical success of my publication of William Siborne’s papers, has developed rapidly into an enormous project, well beyond the original concept of a single volume of less well known primary sources from some of the participating nations in the Battle of Waterloo. Having begun a relentless search throughout Britain for any previously unpublished first-hand material on the Battle of Waterloo languishing in the various archives and museums around the country; it soon became abundantly clear that there was a surprisingly large amount of primary material of historical significance available which was lying virtually forgotten. This, backed by a collection of rare texts, only ever published in various journals more than a century ago and now virtually impossible to obtain; has led to the amassing of a great body of material. The search however went even further afield; similar first-hand material from French, Belgian, Dutch and German sources were sought, which had either never been published or at least never previously been fully published in the English language. This step however is not one that was taken lightly, not personally being sufficiently proficient in any of these languages to achieve the required standard of translation necessary. Letters from the Battle of Waterloo , and subsequent works, has been that it has caused many fellow enthusiasts from all over the world to contact me to discuss various aspects of my work; many displaying an infinitely greater knowledge of certain aspects of the Napoleonic wars, which they have made their particular field of interest. Amongst these numerous correspondents was Martin Mittelacher an American with German roots who is well known through a number of articles he has published on the subject; was persuaded after much discussion, to join in this project, providing translations of the German source material which he, with my assistance, was able to track down and acquire, whilst adding his expert knowledge on the forces of the states. Other correspondents who felt unable to enter fully into this project because of time pressures have nevertheless helped with suggestions for sources; provided links to others who had collections of archive material; helped track down rare items and freely offered advice, support and expertise whenever requested. 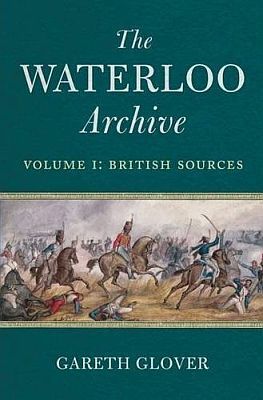 Thus the idea of a single volume of selected texts has rapidly grown into a projected series of no less than six volumes, one to be published each year until 2015, when we celebrate the two hundredth anniversary of this famous campaign, to form a truly sensational library of new primary source material on the Waterloo campaign and the occupation of France that followed.